The audiobook of Hillary Clinton’s What Happened, reviewed. Clinton is not known for the expressivity of her voice. But the What Happened audiobook is surprisingly lovely. Hillary Clinton kicks off her book tour with a signing at the Barnes & Noble in Union Square in New York on Tuesday. The thing about audiobooks is that they rarely occupy 100 percent of your attention. They become background music, melting sneakily into your subconscious thoughts, so that you’re not sure whether the voice you’re hearing belongs to you or to some narrator who’s quietly hijacked your stream of consciousness. This Tuesday a woman in my head was calling Donald Trump a “clear and present danger” to American democracy. I assumed that woman was me. But then she started recounting how one of her staffers phoned the manager of the New Yorker Hotel in midtown Manhattan at 4:00 on the morning of Nov. 9 to arrange for the use of the space; this person couldn’t muster the strength to deliver her presidential concession speech in the soaring glass heart of the Javits Center. Oh, I realized, my own heart sinking. Hillary Clinton. Of course. The experience of listening to the audiobook of What Happened, Clinton’s bracing autopsy of her 2016 electoral campaign, literalizes one aspect of the experience of being a left-leaning human in a country that for nearly a year has been wobbling along under the tiny hand of Donald Trump. Some disbelieving piece of you can’t stop going back over the past. How could Comey reopen the email investigation? Why didn’t Americans acknowledge the role of sexism? Had Clinton truly failed to articulate an economic vision for the middle class, or were her ideas just drowned out by, for instance, Trump’s idiot feud with Khizr Khan? When you download the 16-plus-hour tome, read by Clinton herself, and let it flow out of your earbuds into your brain, it feels like you are not so much entering exotic tell-all territory as surrendering to the ambient arguments of your own smashed hopes. Hillary Clinton haunts us. I listened to her while walking to Dupont Circle. (She was laying into the twentysomething women who approached her after the election and apologized for not voting.) I listened to her while I fed the dog. I tried to listen to her at the gym, but the combination of an image of her lying in bed and staring at the ceiling after Trump’s acceptance speech plus the elliptical machine was too depressing, so I turned it off. What Happened does not, as many reviewers have observed, offer much in the way of dishy gossip or game-changing insight. It is an engaging, beautifully synthesized page-turner that expresses what we already knew in Clinton’s uniquely exasperated, earnest, and studious words. There’s grim fan service: The candidate recalls a moment of prolonged eye contact with Michelle Obama right before Trump’s “American carnage” speech. There’s also score-settling: Neither James Comey nor Joe Biden emerges with dignity entirely intact, though few come off looking as petty and foolish as former Rep. Jason Chaffetz, who tweeted cruelly about Clinton on Inauguration Day, or Ryan Zinke, who stupidly called her the “Antichrist.” Others will surely litigate (and have litigated) whether Clinton has apportioned fault with perfect exactitude and justice. (At any rate, for all her irritation and dismay around the press, the Russians, and the “deplorables,” she reserves a towering helping of blame for herself.) But to listen to What Happened as an audiobook is to brush up intimately against what may be the work’s main virtue. The memoir expertly conveys Hillary to her audience—a slightly looser and less inhibited version of Hillary, maybe, but still the same person our trauma compels us to revisit. As she comes to terms with 2016, so do we. Clinton is not known for the expressivity of her voice, but of course no other narrator would have sufficed. She infuses the words she wrote with warmth, annoyance, and Chablis-dry humor. She is clearly performing—to narrate a book is to read a script—but she comes off less as someone acting out the drama of her own life than as a person who prefers to have collected and arranged all of her thoughts before she speaks them. 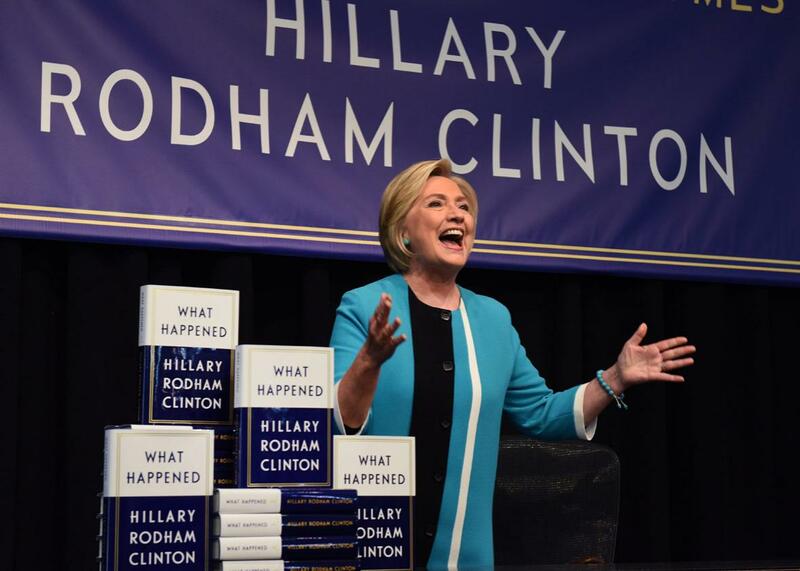 (What Happened plays up the candid, curtain-raising parts of the project—“I didn’t go public with my feelings,” Clinton says, approximately 90 times—but the book still feels mindfully composed.) You can hear how she has practiced the laugh on the first syllable of “Twitter” when she mocks Trump’s social media obsession. That rueful vocal shrug when she muses that she’s “just not wired” to stir up voters’ resentment might have taken a few tries. But Clinton’s latest efforts to connect, she suggests, have their place in a lifelong struggle to redefine her carefulness as a genuine way of being in the world, not as a cynical shield. Anthony Scaramucci dutifully reading from his autobiography would be ridiculous. A less studied Clinton would feel like a less authentic Clinton.